On Monday Democrat Adam Schiff, the leaker and head of the House Intelligence and Financial Services Committee, subpoenaed the Trump Family bank records with Deutsche Bank in Germany… because he can. Democrats have no reason to subpoena private bank records except to harass and continue their political witch hunt of the US president and his family. Eric Trump responded to the request on Twitter after the Democrats continued with their latest harassment. 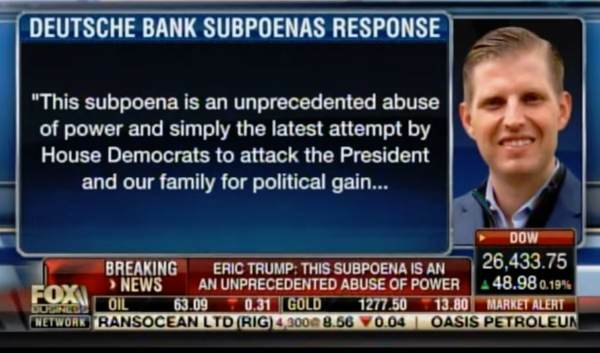 Eric Trump later released a statement on the subpoenaed bank records.